Custom designed Rose Mercury ~ Aluminum Mercury ~ Gold Mercury ~ Rose Gold Mercury ~ Black Mercury ~ Copper Mercury ~ Red Mercury ~ Burgundy Mercury votive candle holders. They are beautiful & stunning. This listing is just for 50. You can order as many and in what ever color you choose. These are a Mercury / Droplet Effect Painted on the inside of the votive holder. These are different because they are painted inside. I have tested them with fuel cells and there is no issue at all. You have the glass effect outside and the Mercury inside. What is different about these .... - these are painted on the inside. Truly one of a kind. Many colors to choose from. All of our Votives Holders are hand painted. Each votive is a one-of-a-kind. There will be slight variations in color and design. 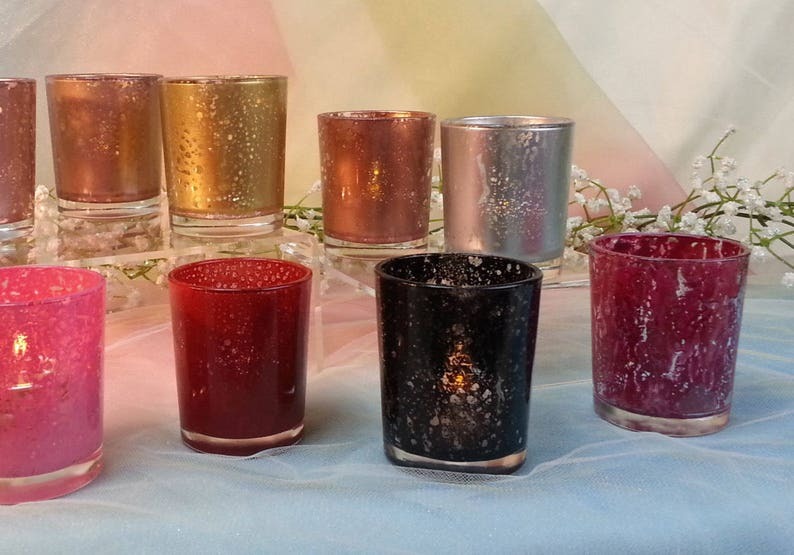 These Beautiful votive candle holders shimmer and shine with or without a votive. But they do look best lit up. They fit votive or tea lights. I recommend our Fuel Cell. No odor and they burn for 8 hours. Let me know and I will invoice you for these. the price is .75 cents per fuel cell. I have 2 different styles. Take a look. If you would like the fuel cells and / or gift wrapping option please send me a conversation so that I may included it in your listing. Minimum of 1 week for creation then shipping to your location. Size - 2" W x 2.75 H / aprox. - my votive candle holders are larger than most. These are not food or drink safe - the mercury paint is on the inside. Any Questions / Special Orders ... please email me. We have done our best to represent the colors. However due to monitor displays there will be a slight variation in color. Can be washed however, do not leave them in water. 🎈I Since I sell these on many sites quantities might differ and delivery times may vary by a few days only. 🎈Shipping price is for 48 United Contiguous States only - other locations please message me for price quote. Beautiful votives, everyone loved them at our event! It's a beautiful and nice color for special occasion. Gorgeous. Perfect addition to my home. Thanks! How long until I receive my order and how will it be shipped? Most orders are shipped within 1.5 weeks via USPO Priority Mail or Fed Ex. Can I get them in less than 1 week? Sometimes yes - message me and see what I have that is readily available. I tend to stock the Gold Mercury painted on the inside just for this reason. I just might have what you need ready. If you must return a product, please contact me with any issues, I will refund you on the cost of the product, not the shipping.